Bread is a staple foodstuff; one which most of us eat and feed to our families on a daily basis. Bread produced through slow fermentation using a mixed population of yeast and bacteria has been an important part of our diet for millennia. But bread has changed over recent decades, and the product you will now find on most supermarket shelves bears very little resemblance to ‘real’ bread which can be produced in a less industrialised setting. 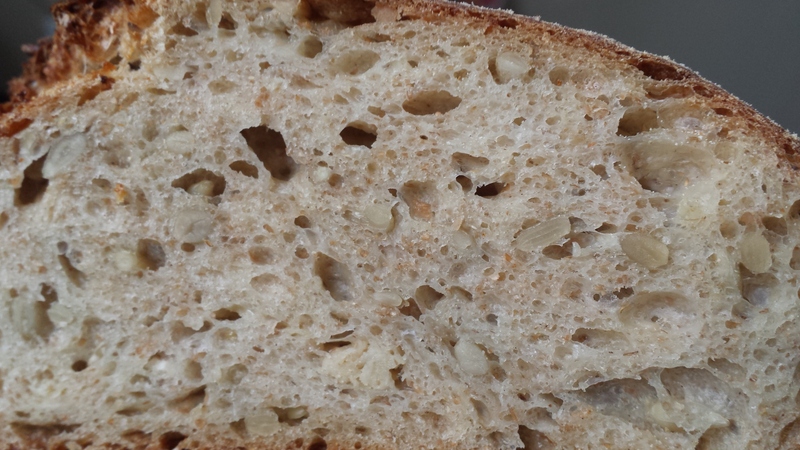 For reasons of aesthetics, extending shelf life, shortened production time, and improved machinability (reducing wear and tear on factory machinery), most retail bread has been subjected to chemical processing and refinement which has robbed it of its flavour, texture, and most importantly much of its nutritional benefit. While it has for some time been a trendy DIY (diagnose-it-yourself) condition, there has been a genuine massive increase in gluten intolerance over the last half century. Gluten is a protein found in grains such as wheat which can induce a severe immune response in intolerant individuals. There are a number of theories as to the cause of this phenomenon, but most focus on the industrialisation of wheat growing and processing. One interesting observation is the loss of diversity in wheat species being produced. In the past, like most crops, many different species were grown on farms, meaning that even flour produced in a small local mill was likely to contain a genetically diverse range of wheat. By grain suppliers selectively breeding grain for desirable characteristics such as improved yields and better resistance to pests or adverse weather conditions, a great deal of wheat’s genetic diversity has been lost, and indeed the wheat we are being supplied with at the moment would probably not occur in nature. There is now a movement to revive some so-called ‘heritage’ wheat and thus reverse this trend. However, it seems that the way in which the wheat is handled after harvesting is possibly a more significant factor in eliciting gluten intolerance. 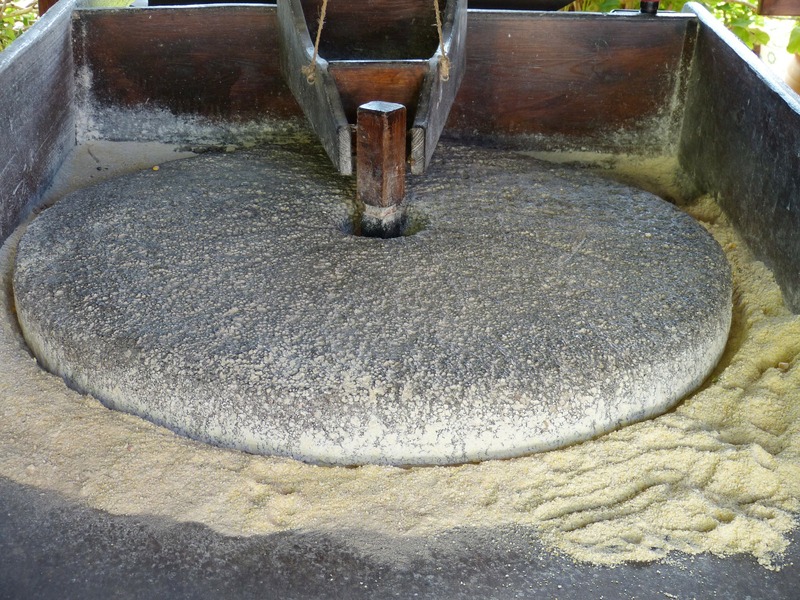 As with the wheat itself, the yeast used to ferment bread has been selectively bred to such an extent that the Saccharomyces species used in industrial bread production is a genetic freak, capable of digesting starches and producing carbon dioxide at a rate many times faster than its cousin found in nature. This yeast also is used as a monoculture, without any assistance from ‘friendly’ bacteria which complement and aid Saccharomyces in its digestive functions. There is quite strong evidence that it is this rapid incomplete digestion of the wheat flour prior to baking which may be largely responsible for the rise of gluten intolerance. Two landmark peer-reviewed studies documented no adverse effects when coeliac patients were fed sourdough bread which had undergone a prolonged fermentation. I’ve gone off on a little tangent there, but while I am not myself gluten intolerant, I do know several people that are, and to me it flags that there is something very wrong with the way bread production is going that bread, the so-called ‘Staff of Life’ is now proving to be a toxic and debilitating substance. From my own point of view it is a lack of flavour and poor nutritional characteristics which deter me from eating mass-produced bread, and I am not alone. There is a growing movement internationally with the aim of encouraging individuals and bakers to regain the lost art of bread making. The Real Bread Campaign in the UK and Real Bread Ireland are but two of the bodies set up to support both home and small scale commercial bakers in this enterprise. For thousands of years, humans have relied on traditional methods of bread production to produce flavourful healthy food. Now, as then, every one of us is capable of producing a great loaf of bread using only three ingredients; flour, water, and salt. Bread produced in this way should be safe for all but those few coeliacs amongst us to enjoy. You may notice that I have not included yeast in the list of ingredients, and although yeast is needed to leaven bread, ie make it rise, we do not need additional yeast other than that which nature provides. Bread made in this traditional manner is known as sourdough, and for those of you who haven’t tried making it at home I implore you to do so- you will be amazed at the flavour and texture of the bread you can produce after only a little practice. 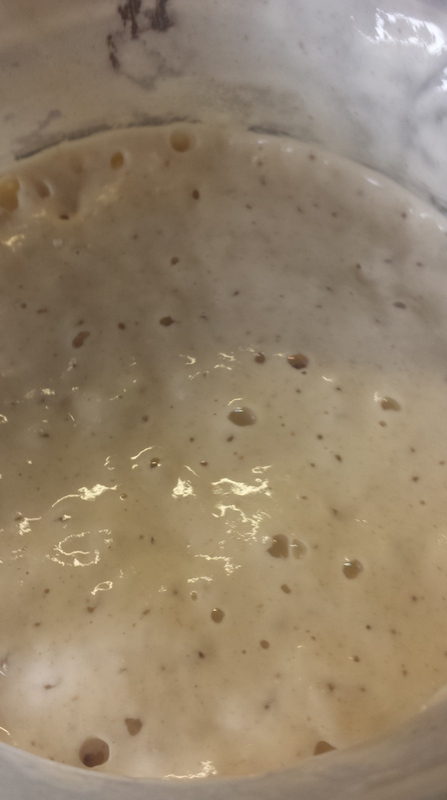 In order to make sourdough, you will first need a starter culture. It is this which provides not only the yeast which we have spoken about, but also a whole ecosystem of acid-loving bacteria (mostly Lactobacillus species) which also ferment starches and sugars in the dough, giving it a wonderful depth of flavour and a very different nutritional profile to store-bought bread, including a much lower glycaemic index. There are many other resources online (see below) which give good detail on how to create a starter, but it is very simple. It needs to be prepared and kept in a non-metallic vessel with enough room to allow the starter to rise to twice its volume at each feeding. 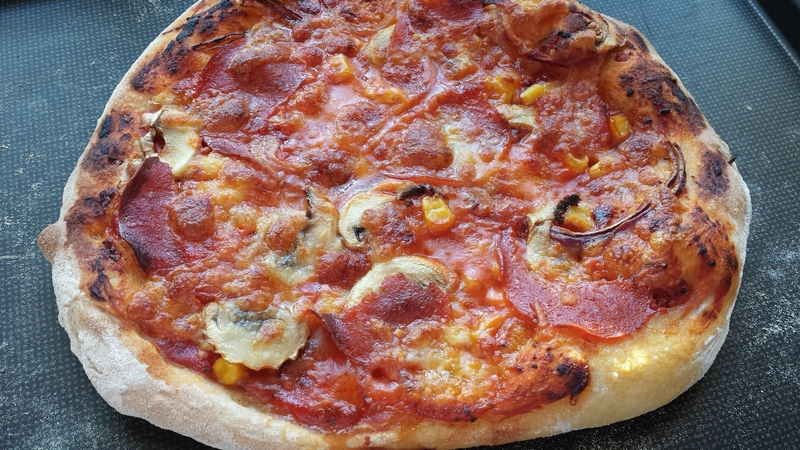 If your water supply is fluoridated, as ours is in Ireland, I would advise you use bottled water both for your starter and dough each time you bake, as I have found my starter doesn’t like having to deal with our tap water and gets a tad lethargic. However, we also have very hard water in this area, and this could also be part of the problem. My lovely bubbly starter. Isn’t she beautiful? Day 1: mix 30g of water and 30g of bread flour in your container. Cover to prevent dust and other undesirables getting in, but do not make airtight. Days 3+: repeat daily until you begin to notice small bubbles forming at the surface of your culture. Your starter is now alive! At this point, it should still be fed daily, but I generally discard or bake with two thirds of it before feeding to prevent it becoming too sour (for my taste). 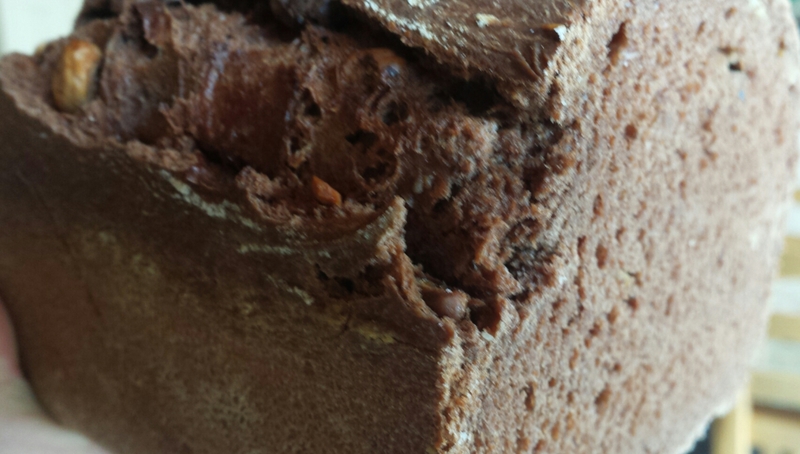 I find this also maximises its leavening power. An active, mature starter should bubble and double in size a few hours after feeding (see below). That’s it- you have a sourdough starter you can use to bake your own ‘artisan’ breads. If you take proper care of it you may even be able to pass it on to your children, as there are many bakeries around the world which are proud to be using the same culture for several decades. While your starter is perfectly usable, the bacterial population within it takes a couple of weeks to stabilise, and you will find the bread you bake changes and improves over this period before you achieve a stable culture. For any readers in Ireland, I am happy to send you a ‘seed’ of my starter, it should be happy enough to travel in the post for a day or two. Just like with other breads, you can make sourdough as simple or complex as you like. While a simple white sourdough will always be a great favourite in our house for making baguettes, sandwich loaves, or pizza bases, I also like to make wholewheat or rye breads enriched with seeds, nuts, butter and even chocolate. 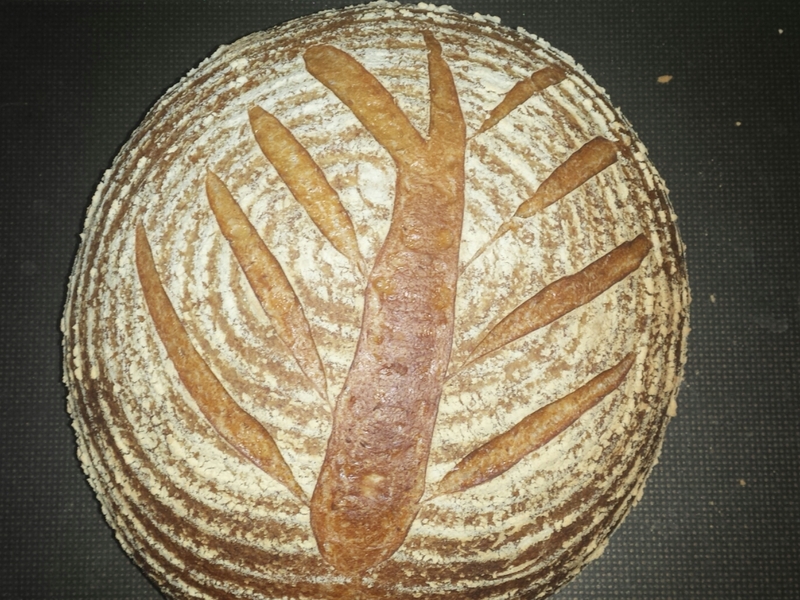 Sourdough is versatile and flavoursome, but it is slow food. Allowing time for texture and flavour to develop is crucial, and although you will find many bakers adding instant yeast to sourdough recipes to speed things along, this is not necessary, and to me it misses the whole point of using a natural yeast and bacterial culture. When I say this is slow food, I mean really slow, and though at first glance it may appear to take a massive time commitment to produce sourdough, this is not the case. I often work long unsociable hours, and because of this it is actually easier to fit sourdough baking into my life. Rather than needing to set aside 3-4 hours to produce a ‘normal’ loaf of bread, I can dip in and out of my sourdough in between other tasks; the actual amount of ‘hands-on’ time is minimal. I think the key thing to realise is that the baking schedule is VERY flexible; I usually prepare my dough 24 hours in advance of baking, but you could easily decide that 12 or even 120 hours suits your schedule better. Once your dough has been developed, it just needs to be covered and left to sit in the fridge until a couple of hours before you need it. Sound complicated? It’s really not once you get going at it, so enough waffle from me- here’s how to produce your first loaf. Feed your starter approximately 12 hours before you intend to use it, add 60g of water and 60g of flour to approximately 60g of mature starter. *Most bakers use a touch more salt, but once I hit 10g for this amount of dough I can start to taste it in the finished loaf. Step 1: Roughly mix flour and water in a bowl. Allow to stand for 20 minutes. This period is termed autolysis during which time naturally occurring enzymes in the flour begin the process of dough development. Step 2: Using your hand or a spoon mix in salt, followed by starter, until you have a roughly homogenous but lumpy mass of dough. Stand for one hour. Step 3: Lightly oil a clean counter top. Scrape your dough out of the bowl onto the oiled surface. Stretch and fold your dough. This involves reaching under one side the dough, stretching it out, and folding it back over itself. You need to repeat this on four sides, folding the dough like an envelope. Turn the folded dough over on the counter so the smooth side is left facing up. Cover with your upside down mixing bowl. 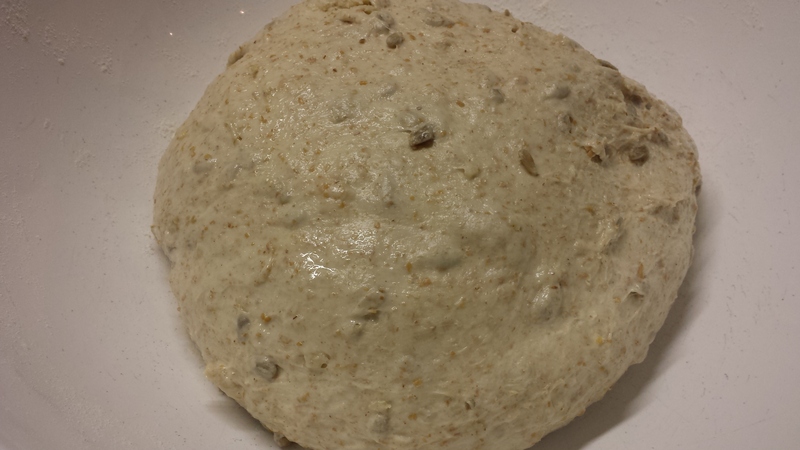 Repeat every 20-30 minutes for 1.5-2 hours until the dough is smooth and elastic. 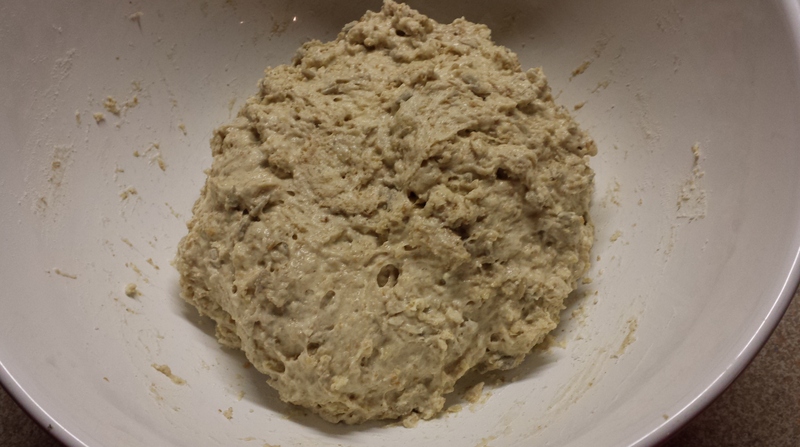 Step 4: Form your dough into a ball and place in a clean bowl (I don’t oil mine but most people do). Cover with cling film. Allow to rest at room temperature for 3-4 hours. From this point, your dough will probably be ready for the oven in about 6 hours if left at room temperature. If this doesn’t suit your schedule, or if you would like to maximise flavour development, place the dough in the fridge for as long as you need to up to about 4 days. Step 5: Remove from the fridge if applicable and allow to warm up for a couple of hours. You should notice that it has at least doubled in size and has a lot of large bubbles bulging at the surface. When making other types of bread you would usually try to get an even crumb, with lots of tiny bubble evenly distributed throughout the dough, but these larger bubbles are characteristic of sourdough and are considered desirable. Step 6: Lightly dust the surface of your dough and your worktop with flour. Gently tease the dough out of the bowl so that the floured side falls onto the floured countertop. Fold the dough over on itself by pulling over 6-8 points around the edge into the centre then turn it over so the smooth side is left facing up and allow to rest for 15 minutes before shaping it in whatever way you prefer. Allow to proof on a baking sheet or in a proofing basket (banneton) for 1.5 hours. Step 7: One hour before baking place a lasagne dish in the bottom of your oven and preheat the oven to 220C. 5 minutes before placing your loaf in the oven pour a couple of cupfuls of boiled water into the dish to create a humid environment. This will help your loaf rise well and improves the crust. Step 8: Check to see if your dough is ready- an indent made by a floured finger should bounce back 50-75% within a couple of seconds. Place it in your oven towards the top, being careful when you open the door as the steam will billow out towards you. Bake for 15 minutes with steam before removing your lasagne dish, then dry bake for between 15-35 minutes depending on the shape you have chosen until the bread sounds hollow when tapped on the underside. Place on a cooling rack until fully cooled. Step 9: Slice and enjoy! How to make a rye flour starter by Riot Rye; Ireland’s foremost authority on all things sourdough, conveniently located in my native county! Welcome to blogging! 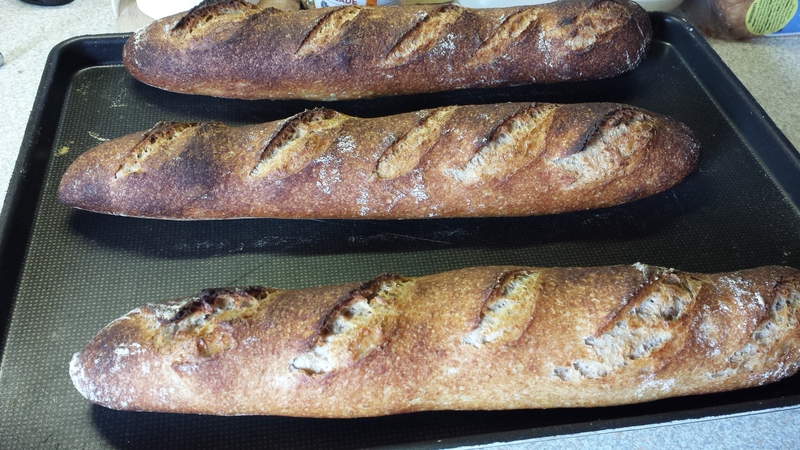 Those baguettes look fab. I’ve never made sourdough, I don’t have the patience to wait. Thanks Sinead- I figured there might as well be two of us glued to the laptops at night 😉. Give it a go at some stage, the dough does its thing overnight in our house so I’m asleep for the waiting part. Welcome to the world of blogging! Great post, looks delicious!! Looks great, might have to give this a go! Hurray! I might have a convert– thanks a million for the comment and for checking it out. I am super impressed with the Sourdough, it’s something I keep meaning to bake but haven’t as yet, I really must after seeing this! Most of our bead is homemade, sliced pans are only pulled out in emergencies, there is nothing like the smell of freshly baked bread wafting through the house! Thanks Nicola :). I’ve been baking bread since I was a kid, but sourdough really kicks it up a level and it’s really all I ever bake now. Jump in, you’ll love it! Welcome to blogging and what a great starter (couldn’t resist the pun 😉 ). I’ll definitely give this a go, been thinking of it for a while. Great blog! 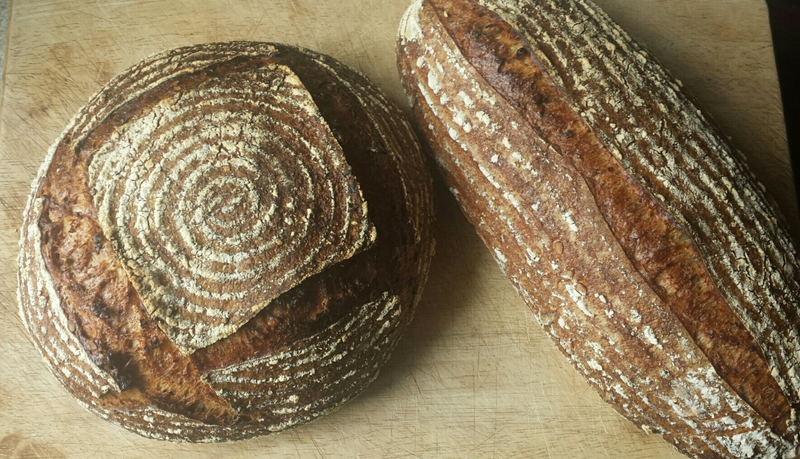 Never had much luck with sourdough – could I please try your starter? Thanks Pete. Absolutely, I’d be delighted to help get you going. If you want to send me your postal address to soursofgrain@gmail.com I’ll send you a seed. Thanks for the compliment Emily 😊. I’ll have to look out for that book, it sounds right up my street. There’s a medical text I came across, written in Iran in the 11th century, which cites wheat flour as being vital for health, but only if ‘properly fermented’. I think it’s amazing how food wisdom can be lost. Good luck with the bread, it really is worth the effort. I will surf my way there this very evening. I like dense.